The most complete published account of this award-winning preservation project! "M. Kirby Talley ... has overseen the restoration with great skill, we passed through striking rooms designed by the original architects, Burling & Whitehouse, such as Nickerson's soaring art gallery." 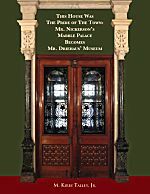 "a wonderful story and masterpiece in historic preservation"
This informative and engaging book showcases the landmark historic restoration and adaptation of Samuel Mayo Nickerson’s grand 19th-century residence for the Richard H. Driehaus Museum, Chicago's new decorative arts museum. Restoration and design director M. Kirby Talley, Jr. provides an illustrated and factual account of the sensitive and meticulous restoration (2003 – 2008) executed with lead architect Joe Antunovich AIA, general contractor Rick Juneau (Vice President, Bulley & Andrews), and over 40 specialist firms. 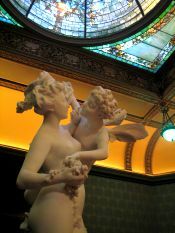 The mansion and its lavishly designed interiors have been restored and furnished with selected objects original to the house, and enhanced with period decorative and fine art selections from the Richard H. Driehaus Collection, with an emphasis on Tiffany. 58 pages; 35 color & 21 black-and-white photographs; then and now illustrations; restoration highlights in color; historical data with contemporary accounts; technical information on architecture, design and restoration; precise descriptions of restored halls, rooms and furnishings; complete list of restoration team and advisors; historic photographs courtesy of Roland Nickerson. "The museum's interior design is in the spirit, rather than in slavish imitation, of the original decor," says Talley. He combined objects that the Nickerson's owned - Japanese bronze torcheres, a Renaissance Revival suite, ebonized pieces attributed to Herter Brothers - with selections from Driehaus' warehouses full of Sevres procelain, landscape and portrait paintings, and Tiffany vases, lamps and chandeliers dripping with seashells and iridescent glass. Copyright M. Kirby Talley 2008. All rights reserved.